Something pretty epic happened earlier this month. Little Bee Books invited my daughter Lucia and I to join for a Mother-Daughter interview with the Mother-Daughter writing pair, Sheryl and Carrie Berk! It’s no secret that Lucia has an enormous love for books. She’s been reading since she was 5 and has accumulated a library in her room with well over 200 books, including one of her favorite series, The Cupcake Club (also written by Sheryl and Carrie Berk). When I told her that we would get the chance to interview two of her favorite authors about their new book, Ask Emma, she was ecstatic! It wasn’t long before Lucia finished Ask Emma. In fact, I believe it took her only one day to finish the entire book. She immediately shared with me how much she could relate to Emma, a middle-schooler who loves to give advice. It’s not often that I’m able to read the same books as my girls, so it was nice to be able to read the book and discuss it, together. The book focuses on a subject that is so relevant and sadly, incredibly present in this day and age… cyberbullying. Both Lucia and I have been the subject of cyberbullying. It’s something we’ve discussed at great lengths and I love that Sheryl and Carrie tackled this subject in a light-hearted way that my girls could relate to. I’ve watched Lucia struggle with acceptance already. More than anything, as the Mom of three girls, I want them to be themselves and embrace their originality (as goofy as they are sometimes). Wouldn’t the world be boring if we were all exactly the same? Unfortunately, there is a pressure to look a certain way and dress a certain way, especially in Middle School. I love that Ask Emma was able to give Lucia a fresh outlook and Carrie, someone that she admires, could share that she also had similar experiences growing up. She is someone that I’m proud to have my daughters look up to. Now that Lucia and I have both finished the book, we’ve passed it onto my 8 year old, Iyla. It hurts my heart to know that she may face cyberbullying in the near future. I want her to be prepared. I want her to feel comfortable enough to come to me or her older sister if someone makes her feel any less than they should. I want her to know that it’s not ok to be mean to someone, even if you are sitting behind a screen and no one can see you. We want to believe that our kids will make the right decisions but we all know that it could be any of us who can inflict pain on someone else, without realizing it. I think what I love most about Sheryl and Carrie Berk is their incredible respect for one another. It’s every Mother’s dream for their little girl to follow their hearts and succeed in a field that makes them happy. Listening to them during our interview really inspired me to encourage my girls even more. At only fifteen years old, Carrie Berk is already a bestselling children’s book author, playwright, dancer, singer, actor, model and lifestyle blogger. Carrie has already accomplished more than most people accomplish throughout their entire life. She’s not only successful, but so down-to-earth and humble which is a tribute to her Mother for raising her and cheering her on while she chases her dreams. Coincidentally, Lucia wrote her first blog post last year about cyberbullying. It was a great way for her to get her feelings out after experiencing something that was new and scary for her. 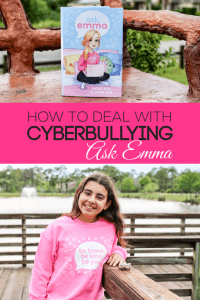 While she’s always loved to write in journals and write non-fiction stories for school, Ask Emma inspired her to start her own blog, The Super Teenage Life. I’m so incredibly proud of her and can’t wait to watch her develop her love of writing. I can only hope that she will be half as successful as Carrie and that she and I will have the close relationship that Sheryl and Carrie seem to have. I want to thank Little Bee Books for giving us this opportunity and Sheryl and Carrie Berk for speaking to us and for writing books that can positively influence their readers to be better people and to stand up for what they believe in. It was such an honor and something we will never forget. We can’t wait for book #2! In the meantime, make sure you run out and get your copy of Ask Emma. Have you or your kids ever had to deal with cyberbullying? Comment below and let us know! A mother and daughter writing duo?? That sounds so amazing! This book sounds so awesome! Wow this book song very nice, I would have to look into getting one! Thanks for sharing. Wow, I really want to present this book to my niece. Thank you for sharing. You did a great job for this interview. I will check their book and make as a gift to my friend. Very inspiring story. You have a Pretty kids. When I was a kid I’m also a book lover. I would recommend this book to my niece as well ? Love this so much! Thanks for sharing about what appears to be a great book for kids! This is an amazing book, must get it for my girls. What an awesome experience for both you and Lucia! Ask Emma sounds like a great book. Great idea for a book, especially because these things are becoming so common! What a fantastic opportunity! I need to keep this series in mind as my little one gets older. She loves to read and I know how awesome it is to have a series you follow and engage with. wow, what a lovely bookworm. she has a bright future ahead of her because reading books will lead her to many information that will help her in her future career. nice interview. It is incredible that we as parents are growing up wit and learning about this alongside our children. I am grateful for resources like this! It must have been a great experience interviewing the authors. Love the fact that you and your daughter read the same back and are able to discuss it. Being passionate about books, can well understand what that means. That book has a lot of really great lessons! Kids need something like this to use for entertainment more often..
We just got this book and my daughter is so excited to read it! I hope she adores it as much as I think she will! What an awesome book for young girls. This is a fabulous opportunity for your daughter. Hopefully this will help lots of other young ladies also! This sounds like a great book for kids. I have to get a copy for my daughter. She would learn so much reading this book. This is great! The book sounds like an awesome read !! thanks for sharing! I was an avid book reader when I was young too. Absolutely loved the secret of droon series. I can only imagine what a joy it must have been for your daughter to meet the person creating her adventures. This sounds like a book my almost 13 year old daughter would enjoy. Sounds like I wouldnt mind it either. ? That looks like a great book for kids. Words can be so powerful. I think kids (and quite a few adults) could learn to build each other up with their words. So glad you had the opportunity to experience this with your daughters, and how cool that you got to interview this dynamic duo! I def. would recommend this to my girls. I love it when there are books that make issues easier to understand for the kids. This one tackles a very important issue these days and I’m sure it’s going to help so much for the kids. What an awesome experience for you and your daughter! I love that y’all got to participate in this! A book like this could really help kids cope and handle cyber bullying. I’m glad there’s a book like this for the kids to read. Cyber-bullying is so unfortunately common these days. It’s great that this book can get conversation going about it with preteens. My daughter was a victim of cyber bullying this year. We need to check out this book! This book sounds fabulous! I’ll have to pick it up for my daughter. I have dealt with cyberbulling–from people who don’t agree with my blog, and I never understand it. I always tell my kids that people who cyberbully are cowards and to let me know about it. It is so great that your daughter has a love of reading. This book looks like it was so fun for her to read. I think I will look into getting it for my daughter. What a great sounding book for kids, it sounds like something that really make them stop and think and bring around compassion. Sounds like a great book for tweens and early teens. I love the sweatshirts on the girls! This is awesome! There should be more of these! Kids now more than ever need positive role models. This is so amazing! this book sounds like a good read !! thanks for sharing! It is great to find books that kids like to read and are relavent in today’s world. You should be proud of your daughter and her love of reading. This books sound amazing for kids! I think there should be more positive roll models in this world that kids can look up to. What a wonderful opportunity for your daughter. Hope this inspires and encourages her to continue her writing.